One of the things that can be more than frustrating in your business is not having clarity around your purpose, your goals, your vision, or even your day to day tasks. Even though you try to push through, it comes with a lot of struggle which ultimately leaves you feeling frustrated, overwhelmed with trying to figure it all out, and stressed out to say the least. Not having clarity in your business is a lot like looking at yourself in a foggy mirror. You're showing up, but you can't see yourself very well. That's exactly what your clients will experience if you don't take the time to clarify how you want to serve others in your life and business. I don't want you burn time and energy doing stuff, and not get anywhere. Building a solid foundation for your business is essential to your SUCCESS and SANITY. We all have been given a unique set of gifts that God has given us so that we can fulfill His purpose in our lives. If you’ve ever felt like you don’t know how to function in your purpose or don’t know what your purpose is, first ask God, and second, look at what your gifts are. God will not require you to fulfill something that He has not or won’t equip you to do. Your gifts are connected to your purpose and when you hone in on them, you can begin to understand how they are to be used. Your skills is something that I consider to be an offspring of your gifts, but they are learned and adaptable. Your skills and gifts are like a marriage that compliments one another. For example, you may be an awesome graphic designer. You perfect your craft by taking classes in color theory and patterns. Your gift makes your skills special because you have an eye for color perception, depth perception which some of us are not gifted with. So look at what you’re good at, not just an expert, but can easily learn and adapt to. Take a moment to reflect in writing or through prayer to uncover what’s unique about you and your abilities. Have you written your vision statement for your business yet? A vision statement is just as important as a business plan because your business plan is designed to help you work towards your vision. Most entrepreneurs have their vision in their head, which is where is starts first, but your vision must be translated into something concrete. Your vision statement gives direction for the future of your life and business. It gives meaning and purpose to ‘why’ you are working towards specific goals and helps you to stay focused on the impact you desire to make. Habbakuk 2:2 says Write the vision, make it plain on tablets, so he may run who reads it. As a Christian entrepreneur, crafting your vision statement is more than just putting words on paper. It is your faith in words, the initiative behind your actions, and your desires and beliefs without restraint. Writing your vision brings clarity of thought and clarity to your purpose and actions. Rehearsing your vision is really practicing mental muscle memory. Your vision becomes a part of who you are rather than a separate entity that only exists when you focus on it. Your vision is the future identity of your life and business. Just as we were asked what did we want to be when we grow up, you should also apply the same question to your business. Give your business its identity so that comparison and doubt does not have time to mold your life and business into something else that is not a part of who you are. A vision statement also guards your energy, money, and time investments. It will help you make intentional decisions as to how you’re going to move forward in your business and how you choose to show up in your business. 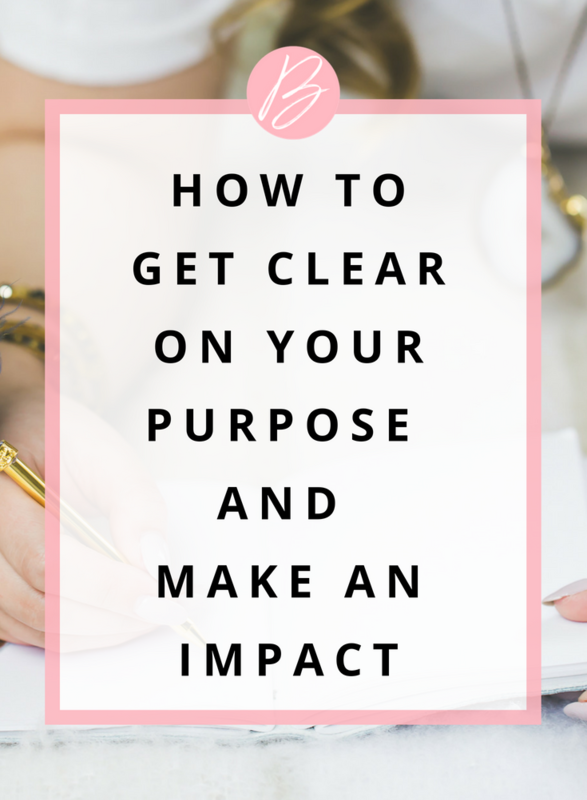 Once you are clear on your purpose and vision and are ready to start making an impact, break your vision down into actionable steps and get clear on the type of client you’re serving and how. Being able to translate your purpose and vision into action is where the power of your gifts and skills really reside. A clear vision and purpose will allow your clients to quickly understand who you are, what you do, and how you can help them. Your gifts, skills, and purpose will attract the right type of clients who want to partner with you because they believe in your gift, your skills, and how you break things down in a way they can understand and decide that what you have is for them. If you struggle with creating a solid foundation around your business so you can be purposeful about your goals and decisions, schedule a free 30-minute consultation about how we can partner together to help you get your business into alignment with your purpose and vision.